Your dates must be at least two weeks from today in order for me to process the reservation!! This unique, privately owned corner apartment, in the W Hotel residence tower, is not only professionally decorated and gorgeous. It is also designed for living and working. It is a fully furnished and equipped dwelling within a hotel setting, providing all the luxurious amenities of a five star resort, with the benefits of a real home. Truly the best of both worlds! The Icon Brickell complex offers the longest HEATED pool you have ever seen (300 ft ! ), spa, gym, restaurants, a rooftop club and pool, room service, valet parking, and a host of other amenities. Floor-to-ceiling glass overlooks the Miami river and park where passing yachts and barges provide free entertainment. There is ample closet space for your belongings, and, unlike many other condos, there is room for your things in this minimalist living space. No useless dust collecting accessories here. Only room for you to make it your own. custom closet storage shelves and rods. Electric blinds - black out in bedrooms and sun blocking in living area. If you anticipate being in the kitchen much, you'll be happy with the better than typical kitchen equipment, like Wusthof knives, anodized cookware, classic beehive blender, and a convection oven! Or, go with room service! Remember, you're in hotel too! Do you like to run, bike, or swim? : Then you will love running along the bayfront, around Brickell Key and down Brickell Ave.
Bike to Miami Beach, Key Biscayne, Coconut Grove, and even beyond, on your choice of the road way, or bike paths. The lap pool will provide you with a great swim, right at your doorstep, or head over to the ocean for more of a challenge. You can get your workout in at the gym with the water view, and still be on time for work, if that's what brings you to the Brickell area. If not, then just hang out and enjoy the spa and pool. Please note!! You must inquire about the property at least two weeks before your anticipated arrival. I travel for work a lot and maintain a few homes. This is one of them. I live in this apartment when I am in Miami and am able to make it available to others when I am not in residence. I am sure that you will enjoy staying here as much as I do. There were hundreds of condos for sale in Miami, when I started looking, and I think I saw almost all of them before I bought this one. I had been searching for six months and when I saw this apartment, I knew it was the one. I loved the views, the project design, the atmosphere, the location and the over-the-top amenities. The floor to ceiling glass walls make me feel like I'm part of the river scene. The pool area is beautiful, and you can even see part of the bay, Miami Beach, and the Key Biscayne Causeway. And I guarantee, if you look carefully enough, you WILL see dolphins and manatees swimming in the river, right from the window! The Icon is truly one of a kind. The decor of the lobby, media room, spa area, restaurant, cafe, and the rest of the common areas, have to be seen to be believed. Additionally, the W Hotel provides a unique vibe. Master bath has jetted soaking tub, with separate glass enclosed shower, double sinks, and linen closet Hall bath has shower with double sinks. Beautiful condo with magnificent views. Great location and walkable to shopping and mass transit. Easy Uber though BUSY entrance area at times. Helpful owner and property manager. Will return to this base when revisiting Miami. Every perfect! Pool is open. Valet parking somewhat expensive, but convenient. Highly recommend. The condo was spacious, super clean, quiet and had a wonderful view. This property is located in Brickell, so one has access(within walking distance) to grocery stores, several restaurants, movie theatre and shopping. Each bedroom has access to phone chargers on the bedside tables and the kitchen was nicely equipped. Due to renovation on the 15th floor, the walk to the gym was a bit longer, but the gym is very nice and large. Communication with owner was excellent. We enjoyed our stay and would return in the future. The condo was in a great location close to some of the restaurants and the mall convenient for us. The condo was in a great location. Very clean condo. Great view from the balcony. I will definitely stay at this location. The owner was great with communicating. 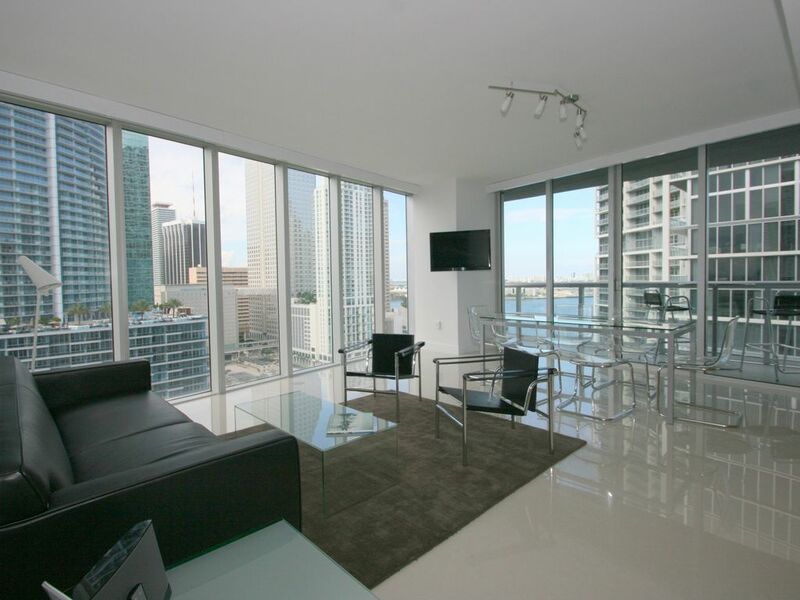 The best of Brickell and downtown Miami at your door. Walk to Publix, CVS, Walgreens, Whole Foods, casual eateries, and fine dining. Miami Beach is only 5 miles away and can be easily biked. Mary Brickell Village, within a short walk offers a Publix grocery store, restaurants, and outdoor dining. Bayfront Park and Miami Bayside with over 100 shops and 20 restaurants and bars is a mile away. American Airlines arena is 1.5 miles north. This is a great area for evening strolls (River walk) and running (Brickell Key). In addition, we are just one block away from the brand new Brickell City Centre with the most upscale shopping in Miami.